Well, I have taught my first class at Charlestown’s Elderhostel Lifelong Learning Institute. You may remember the course description I posted back in August. Brief Description: When Esther Nisenthal Krinitz was 12 years old, the Germans invaded her small village in Poland. Only she and her younger sister survived the Holocaust and emigrated to America. 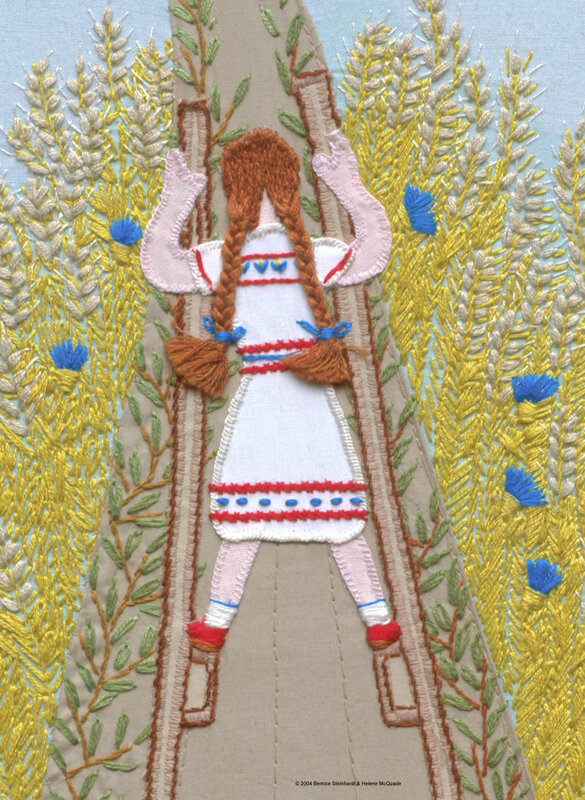 At age 50, Esther felt the urge to create images of her story of survival for her daughters. 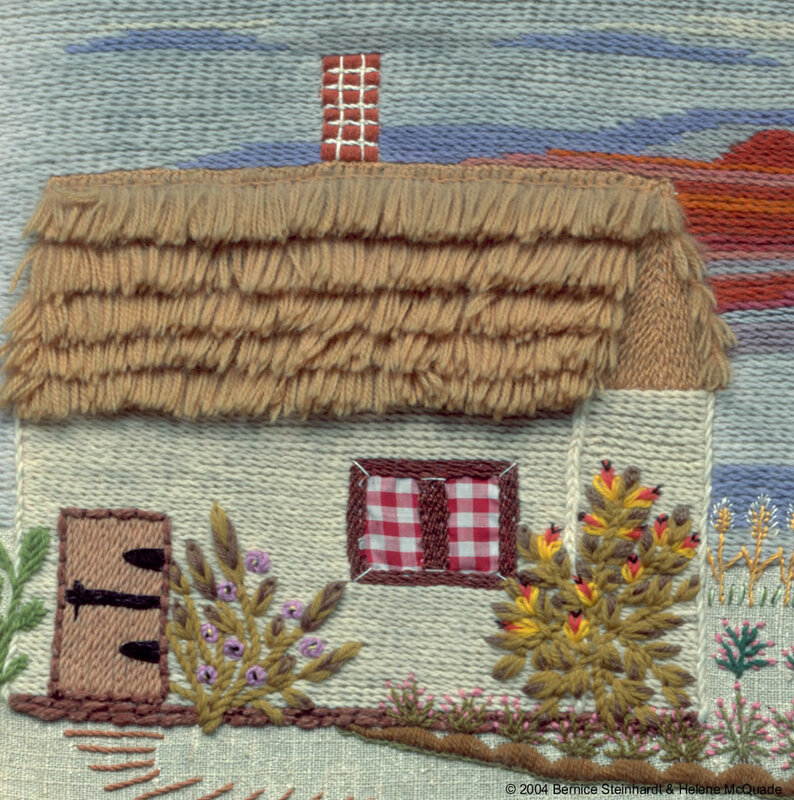 Although she lacked drawing skill, she did know how to sew and embroider. Over the next 20-some years, she created 36 large fabric works of art, depicting her experience. I would like to show you photographs of the works with her narrative and tell you about the techniques she used in creating these beautiful works. That’s what I did on three Thursdays in December. Because of the subject matter, and because I had shown one of Esther’s story pictures on our campus TV, I expected a full room–25 people. Instead just 13 people registered for the course. Of those 13, four were no-shows and four people who had not registered, including a man who thought the class was something about the environment, did show up. Only six people attended all three sessions. 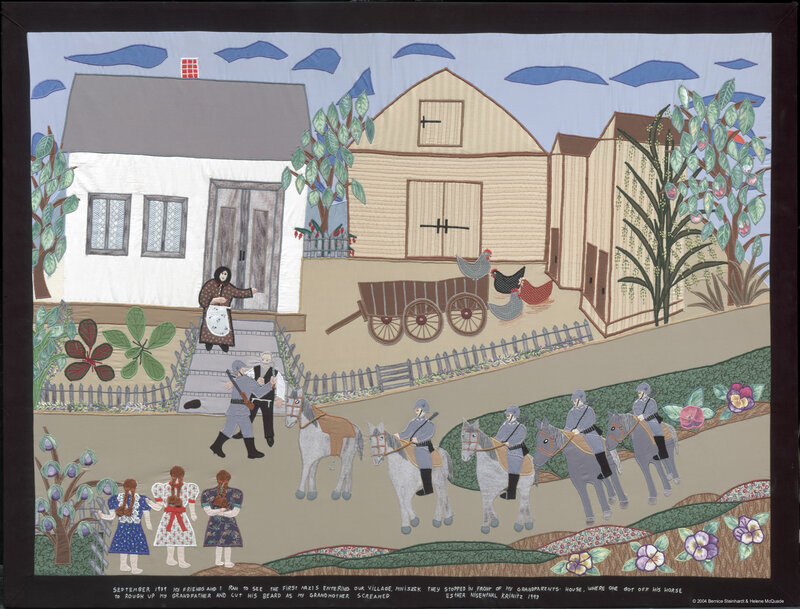 It was difficult to get any participation, despite the emotion-laden story of a teenage girl’s survival of the Holocaust, despite the magnificent images she had created to tell that story, despite the awesome needlework involved in their creation. I know how to facilitate group meetings. I know how to get people involved. By the last session, when eight people were present, we did have lively discussion, but it took a lot of work to get there. I used the book by Esther’s daughter to provide more information about Esther’s life, so that I could talk about her beyond what she depicted in her fabric pictures. 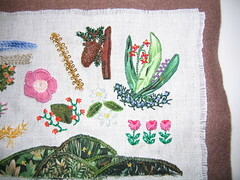 To show the class how Esther had made her fabric images, I replicated some of her techniques and motifs on a sampler. Click on the image to enlarge. Here are details from two of Esther’s pictures. And here’s a detail from another of her pictures. 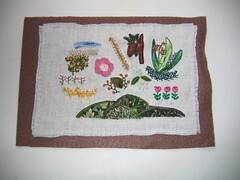 On my sampler, I showed how she used applique with embroidery. Click for enlargement. I took with me the fabrics from which I had cut the shapes I appliqued. 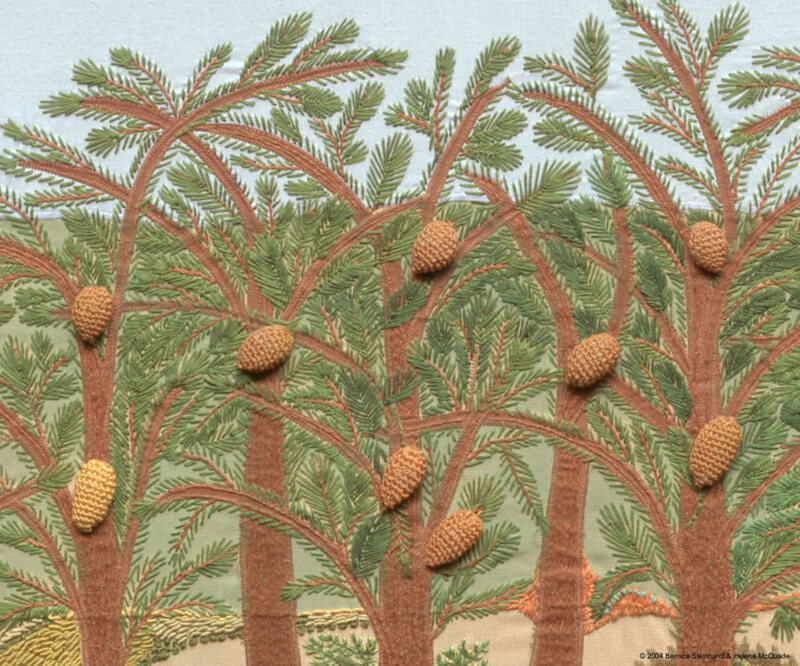 I reproduced some of her flowers and the stalks of wheat through which she walked on her stilts, and I even made a stumpwork pinecone, as she had done. Click to see close-ups at Flickr. For this course, I had spent hours in preparation, including many trips to the classroom to practice using the computer projection system there. Those six people who showed up for three meetings had an exceptional experience–a professional and warm-hearted presentation of extraordinary historical art, made with needle and thread. Although the evaluation sheets were all marked “Excellent, excellent, excellent”, and even though I’ve had enthusiastic feedback from residents who were not there but heard about it from some who were, it was a disappointment. For me, it was not worth the effort I put into it. I did not enjoy this experience. At this website you can see a slide show of all 36 of Esther Krinitz’s works, narrated by her daughters. I hope you will go see for yourself. Next week I have to teach the other course I rashly volunteered months ago to teach, before I knew what to expect of Charlestown residents. I’m not looking forward to it. And I will not be offering any more courses here. Well, do you see what I see in this snowman? 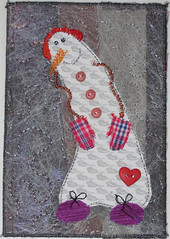 It’s a delightful, whimsical, jolly fiber art card from a special friend in France, Veronique. 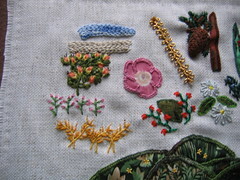 Do visit her website to see more of her creations, in all kinds of needlework. Last year she sent me this Christmas cracker she had made. I’ve used some of the beads and threads that were inside it. Now, do you see what I see? By all means, click on this card to see it enlarged and to enjoy the details. Do you remember Kathy, who shelled about a pound of pecans for me? Another special friend, she’s actually a neighbor here at Charlestown. She sent me this lovely, serene fiber art card. 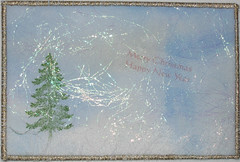 Please click on it so you can see the glinting Angelina fibers and the use of scrim at the bottom. Unfortunately, Kathy doesn’t post pictures of her work on the Web, but she, like Veronique, does many kinds of needlework and produces wonderful results. Thank you, my friends. I do cherish your beautiful work.